Food.OakMonster.com: How deep is your love? I started a tradition at the office of having a Valentine's Day potluck. The first year we did it, we had a table full of sweet stuff. Then we started to encourage savory treats as well. Last year I did a champagne cheese fondue that was tasty despite the look. That taught me that cheese fondue cannot be reheated as it separated into butter and the rest of it. Sticking with the savory trend, this year I made 7 layer dip. Nothing spectacular, really, until I was done with it. Behold, "How deep is your love? 7 layers!" Dip! What's underneath all that is pretty simple really with only a few secrets that drove the office bonkers. They ate the whole thing within 2 hours. My recipe will make use of all of the ingredients. No leftover to throw out or save. Well, maybe a little bit of green onions left, but that's about it. ETA February 2012: Since the first time I make this dip, I've changed the recipe somewhat to be a one-stop shop at Fresh & Easy market. I'll update this to include both versions of the dip below. No-fat refried beans - Heat it in small saucepan and melt half a bag of the Mexican Style shredded mix cheese into it. The other half will go on Layer 5. 1 tub of fresh pico de gallo salsa from the refrigerated section. 1-2 tubs of guacamole. I like sealing off this layer underneath another layer (like the sour cream). If it's on the surface, it tends to go brown. F&E: 2 containers of F&E fresh Guacamole. Mix well 1 big tub of (light) sour cream and 1 packet of Lawry's Taco Seasoning. Yep. It's the secret ingredient that makes people go...hmm...what's THAT? As much as you like of the Mexican Style Shredded Cheese. Black olives, sliced or chopped. However you'd like. Finely sliced green onion to your liking. 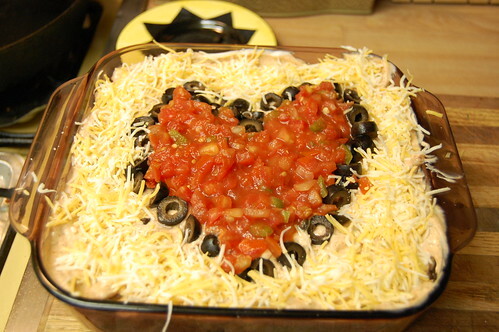 For this V-day dip, I saved a little bit of salsa from layer 2 to fill the heart. In a version I did for Halloween, I put guacamole layer on top, sprinkled with chopped olives for the freshly-dug dirt look. And then I stuck strips of tortilla chips straight up from the bowl, making a little graveyard scene. Oh yeah, have fun making your dip art! Wishing you and hubby Brandon @least good time off coz it fell into weekend day as well as having sometime with people you love, friends n' family or cat n' dog. That's Valentine all about. The day reminding us about the idea of love.